The Eliocalypse: Resonance Dofus update is fast approaching. Why don't you come over to the Beta server and test the new content? The time has come, heroes! The Ebony Dofus has made its appearance in the World of Twelve! When an old dream comes true... When you daydream... When you can't distinguish between dream and reality... Search no more: you're immersed in the 2.49 update, the beta version of which is available now! School's almost back in session… And this has got you in a snit, feeling all blue and woebegone. In short, you're down in the doldrums. We have THE solution to get you buzzing again. Every day, take a hefty dose of Beta 2.48, and say goodbye to those gloomy thoughts! The beta's Kolossium League molecules and pet overhaul particles are guaranteed to lift your spirits. So jump in! The DOFUS update 2.47 “The Stubbyobs of the Freezammer Clan” is now available in the game! Discover all its content on the dedicated page and get to watch Dofus Time to learn more about it. The secret is out: the Stubbyobs, those hairy little creatures, are here. If you don't fear the wrath of these vicious little creatures and if you like bearded ladies, boot up the game right now and test beta 2.47! 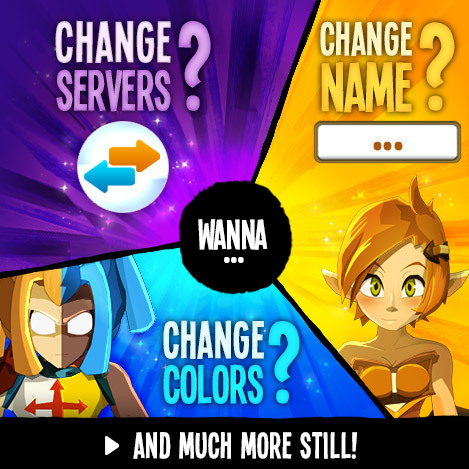 Between the arrival of the 2.46 update and the latest announcements, a little recap on the dates of upcoming events in your DOFUS game seems necessary. Get ready!